Nabtesco’s Hollow Shaft RD-C Series gearhead combines high precision (less than 1 arc-min), high torque and a large center through-hole in a completely sealed and ready to mount package. The patented 2-stage design and integrated support bearings provide extreme rigidity, high shock-load and the ability to support heavy external loads. The RD-C is ideal for any application where high-end positioning performance is required. 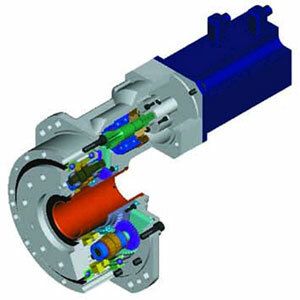 The large thru-hole (up to 5”) can accommodate cables, shafts, etc. to provide the most efficient and space saving design possible. The main internal angular support bearings provide large moment capacities and negate the need for external support devices – reducing design time and installation costs. Several sizes are available with output torque to 138,768 in-lb; moment capacity to 347,179 in-lb and ratio’s up to 253:1.